This session was dedicated to a consultation process to provide feedback for shaping the next State Disability Plan 2017-2020 The facilitators were Llewellyn Reynders, Policy Manager, and Carly Nowell, Policy Analyst from VCOSS. Participants were interested to discuss how the Plan, that guides a whole-of-government effort to building inclusive communities, might better support and empower people with disability to drive real change. 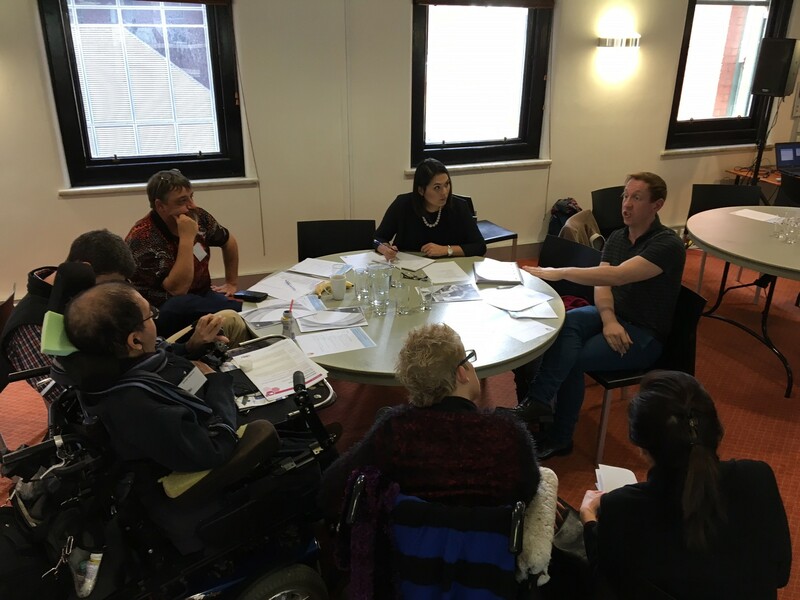 The first discussion focussed on what issues might be of most importance and identified what areas of responsibility the State Government might use to better effect outcomes for people with disability especially where these responsibilities overlap with the NDIS roll out in Victoria. What specific actions do you think the State disability Plan should include? Given this plan covers the NDIS rollout period, what are the main considerations for the State Government during this time? Key issues raised: Improving access across government i.e. transport, housing, education, justice, health, maintain independent advocacy and raising awareness in the general community and mainstream services. The government should legislate that all new housing should meet accessibility standards. There is already legislation around new housing meeting fire safety standards, the same approach could apply to disability standards. Greater education for mainstream services and employers about their responsibilities to be inclusive and accessible. Set quotas, not targets, for the employment of people with disability in the public sector. State Government has a role to support people who do not qualify for support under the NDIS. Making transport accessible in metro and country which includes both physical and information access. What are your views on the proposed themes? What structures or mechanisms should be included in the new Plan to drive change? Key issues raised: Need meaningful measureable targets with robust evaluation, stronger accountability and commitment from government and include people with disability at all stages of implementation and governance. As the NDIS is a national initiative, it should not be a theme under the State Disability Plan, rather identified gaps not covered under the NDIS should be encorporated through all themes. Reorder the themes to raise the visibility of key areas within state government’s control e.g. housing, education, employment, transport, access to the built environment. Need to give rights and equality more weight because when this is embedded then the other themes become more achieveable i.e it’s easier to participate in the community and workplace if you can travel independently on public transport and know you can access the building. Plan is lacking evaluation report to assess progress and relevance of actions from the previous plan. Improved accountability needed. The Plan should set precise targets and KPIs for different government departments and they should be made to report on this to parliament every two years. Introduce 12 monthly audits to track progress and review actions. Suggestion that the Victorian Equal Opportunity and Human Rights Commission might undertake this task. The feedback collected from this session will be compiled into a report that DARU will submit to the Office for Disability along with a similar report provided by VCOSS that they collated from their community services consultation.